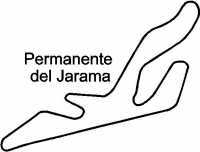 Permanente del Jarama Circuit graphic decal / sticker. The Circuito Permanente del Jarama (Permanent circuit of Jarama) is a 3.404 km (2.115 miles) race course in Spain which hosted nine Formula One Spanish Grand Prix. Designed by John Hugenholtz (who also created Zandvoort and Suzuka), the circuit was built by Alessandro Rocci in 1967 north of Madrid in arid scrub land. It had a short straight, as most of the course consisted of tight, twisty corners; overtaking was extremely difficult, as shown by Gilles Villeneuve, worthy driver though he was, and his successful defence of the lead for the entirety of the 1981 race despite a tail of four cars significantly faster than his. Jarama hosted its last F1 race in 1981 directed by Alessandro Rocci when it was deemed too narrow for modern racing; its still holds occasional sports car and motorcycle races.